Designer, edged weapons master and Cutlery Hall of Fame inductee Gil Hibben has literally been at the grindstone for decades. He has turned out countless functional works of knife art. 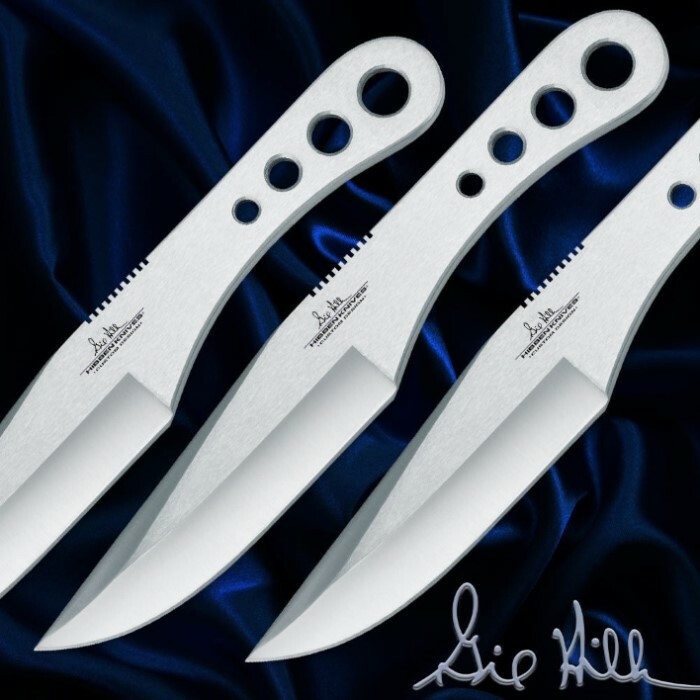 This Professional Throwing Knife Set has been crafted for the discerning collector. Produced with a higher quality fit and finish, these throws are ideal for target practice, demonstrations, hunting and more! Set of three balanced, stainless steel throwing knives, complete with genuine leather sheath for belt carry and storage. Each knife measures 8 1/2 in. overall. Ready to take your throwing knife accuracy to the next level? 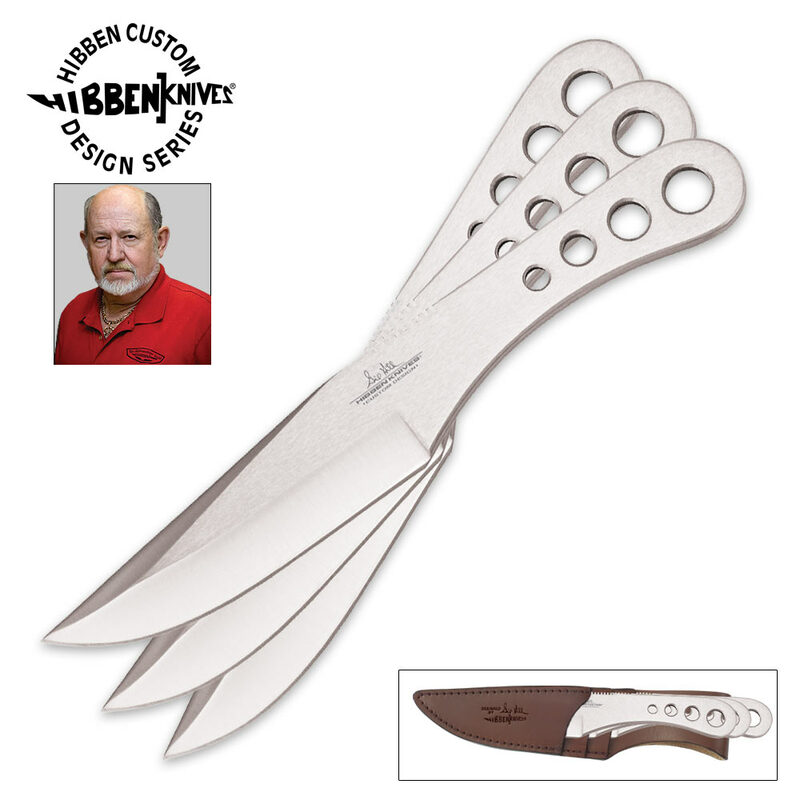 Gil Hibben is also an instructor and published the detailed Professional How-to Guide For Knife Throwing . these are very nice knives the don't require string which is good if your lazy. They are very sharp when u first get them and when the dull i just sharpen them with the back of one the knives in the set. The one bad thing is the tips dull a little quicker than i anticipated, they never bend though they are very sturdy. These are perfectly balanced and go into targets nicely, these are not very good for the no spin throwing technique though it seems, I've tried people, and failed miserably. the leather sheathe is a very nice peace that comes with it as well, only get stuff with leather sheathes and this overall is a very good buy for a beginner like me. these go nicely into about any target, and if your aren't sure you should buy these, if these are all you can afford go for it don't get stuff with string. Great for beginners and experienced throwers alike, great balance and shape allows for plenty of different throwing styles and tricks. this is one tough knife i got a set of these from another store but normal knives will bend and break when they are bounced on to concrete but not this one the tip is very strong this is a good knife for pros so if you are not very good at knife throwing go to you tube and type in combat knife throwing it is well worth the 10 minutes.